Who does not know it very well believes that the Beetle is simply one of the ordinary cars that have been built during the years, and also that it is quite simple or even basic. Nothing more incorrect! Since its birth the Beetle has been a revolutionary car with very refined device and solutions for the time, and some of them are still not very common in utility cars nowadays. In this page you will be able to go thoroughly into some of the peculiarities which made and make the Beetle an unique car. The crankcase engine, transmission, synchromesh and cylinders heads are all in light alloy; this fact associates the Beetle engine more to the one of an airplane rather than the one of a car. This also explains why, in spite of appearances, the Beetle weighs only 780 kg (655 kg the models until '52). It is also important to underline that the qualitative standards of construction have achieved such a high level to allow the elimination of the running-in period since '54. A curiosity: at the beginning of the sixties more than half magnesium consumed in Germany was used by Volkswagen just in order to manufacture the Beetle engines. The chassis with central beam and the bodywork are completely in treated steel in special anticorrosion baths. This is one of the reasons that made the Beetle so strong and long-lived, even if it is reported that the quality of the steel used during the 60 years of production has not always been the same. In particular in the cabriolet (built from the Karmann carriage-works) low quality of steel and less sophisticated working procedures then those of Wolfsburg have been used. In any case, even if they are Beetle or Super Beetle cabrio, coachbuilders knows how difficult is to repair the body of the Beetle in comparison with other cars. The torsion bar was invented and patented in 1931 from Ferdinand Porsche who adopted it for his "creature" since the beginning. The Beetle has torsion bars and stabilizer bars both on front and rear chassis, and the suspensions are independent on all the four wheels (solutions not very common for the vehicles of that epoch as already stated). In particular the arms of the front chassis form parallelograms that make up a perfect geometric system of direction and springing in any conditions of the road, . That makes particularly comfortable the Beetle driving and suited to any kind of ground, guaranteeing an excellent traction (become legendary) also on sand, mud and snow. This is indeed a refinement present (in the past as well as today) only in the most refined sport cars. The oil cooler guarantees the optimal maintenance of the oil temperature, helping therefore to keep the temperature of the engine low. Moreover there is a special thermostat which regulates the canalization of the oil according to its temperature preventing, for example, its passing through the cooler when the engine is cold. This also permitted to limit the oil quantity into the box only to 2,5 litres. But where is the cooler? It is in the fan housing box, arranged in a way to be directly invested from the air flow that cools head and cylinders of the engine. The automatic choke of the carburetor is a quite simple mechanism, but very effective. It is made up of a heating electrical element placed next to a bimetal coil springs which is connected to a shaft. This shaft sets simultaneously in action a choke flap that opens or closes the passage of the air in the carburetor (and therefore it enriches or impoverishes the air/fuel mixture) and a little cog-wheel on which the lever of the main throttle valve leans. When the ignition is switched on and the engine is cold, the bimetal coil-springs at the same time releases and sets in action the choke flap that enriches the mixture and the cog-wheel that holds high the idling speed: as the temperature of the heating element increases, the mixture gradually is impoverished and the idling speed reduced. The result is that whatever the external temperature be, not only the Beetle starts immediately, but it also holds on the right value the idling speed. It has to be underlined that if this behavior is usual in modern cars, it was not so in the oldest (who does not remember the several knurls to set in action the choke flap manually and to raise the idling speed?). This is another sportive car refinement. The air inhaled from the carburetor passes through a metallic hairnet first and in case of powder or dirty they are captured from the oil and settled on the bottom. With other details (also the engine oil strainer uses a similar system and therefore it never goes replaced, but only periodically cleaned up), this made the upkeep of the Beetle really the lowest, fastest and cheapest. Another uncommon refinement. The hydraulic damper steering (introduced in 1960) has the aim to eliminate vibrations and reactions of the steering in any kind of ground, but above all on bumpy roads, making the driving more fluent and pleasant. Moreover, at the end of a curve, the damper docilely helps to bring back the steering in the central position. Its action is very important, in fact when (after several years) the damper doesn't work correctly, the effect is frightening: taking a hole or a subsidence of the road in a particular angle-shot, the steering begins to sway in whirls and there is no way to stop it except braking roughly. A famous advertisement about the Beetle, among the other things, said: "The air never boils". Actually this is one of the reasons for which the Beetle was suitable in the torrid Africa as well as in the icy Russia during the war. In fact, if you think about it, the "philosophy" on which the air cooling is based is as simple as effective. In a traditional normal car the cooling of the water in the cooler depends on the speed of the car, therefore -for example- in a very steep road, the effort of the engine is maximum, but because of the low speed the cooling of the water is minimum. On the contrary, in a air cooled car, the fan turns at the same speed of the drive shaft and in the previous example (highly run engine and low speed) the cooling of the cylinders is guaranteed. The large fan of the Beetle blows up to 500 litres of air for second (19 cubic/feet! ); moreover the flow is regulated by an automatic thermostat that changes the blown air ammount according to the engine temperature. The Beetle has been built also with the "automatic transmission", but this model is not very common in Italy. The first version dates back to '67 and it also had the rear axle with double joint; in '71 it became also available on demand on the Super Beetle 1302 and 1302/S too. In a time in which, here in Italy, they discuss about the possible problems that the old cars (among wich there is the Beetle) could have running with the so-called "green" (unleaded petrol), it can be interesting to know that the Beetle has already been catalyzed since '75 in California and since '76 in the rest of the United States. 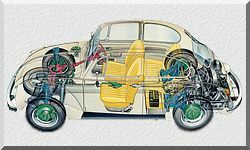 This, obviously, does not mean that we will have to install the catalytic muffler also in our Beetles, but it points out that those device of the engine that could suffer from a lead absence (the valves and the guides-valve), in the refined boxer of the Beetle have been fit for the "green" since a long time. Acrylic paint substituting nitro paint was introduced from '49. Actually the resistance of the Beetle to the corrosion (another fact that entered into legend) is due not only to the quality of steels used, but also to the high quality of paint and to the methods of painting. An Italian advertisment of the sixties said: " If it rains, it rains on everybody, but with the Volkswagen you are better than the others. With its four varnish layers, the road is its garage". Personally, both with my former Beetle (a German of '67) and with my present car (a Mexican of '84) I have always had difficulty in persuading those who asked me that the paint was still original. The Cx of the Beetle, measured in the wind tunnel of the Polytechnic of Stoccarda on the final prototype, measured just 0,385. This datum increased to 0,41 in the mass-production, but in any case it remained an exceptionally low value for the epoch (we were in '38! ); you have to think that the aerodynamic Lancia Aprilia hardly reached the 0,47 (0,44 a Fiat127 and 0,41 the first model of the Golf). The datum was also confirmed by the particularly low value of the absorbed power to travel to 100 km/h: only 15 CV. To make a comparison you have to think that a modern Volkswagen Pole first series absorbs 17,2 CV at the same speed. Anyway, you have to notice that the aesthetic modifications introduced in the '67 (squared bumpers and vertical headlights) made the Cd of the Beetle meaningfully worse and in the last models it appeared to be equal to 0,48.